GRAND HAVEN – Coach Shane Fairfield had his players going for a few short seconds. 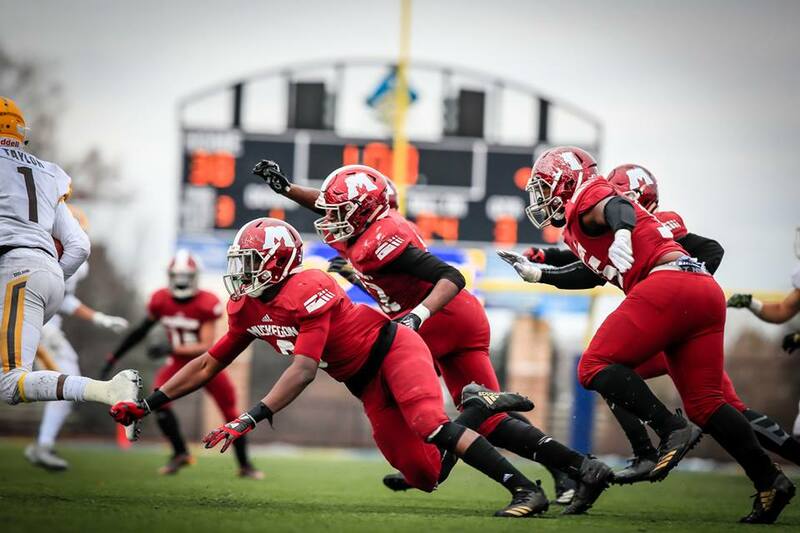 He approached his jubilant Muskegon Big Reds in the postgame huddle on Saturday after they had taken care of business with a dominating 45-22 victory over Zeeland East in the Division 3 state semifinals at Grand Haven High School. “I’m a little confused. My thinking is a little hazy,” Fairfield began, speaking softly. His players didn’t need to respond, because they all knew the happy answer. They’re returning to the promised land – Ford Field in Detroit – for the third straight season. The Big Reds will have an opportunity to defend their Division 3 state championship and become the first team in school history to repeat as state champions. But standing in the way will be Detroit Martin Luther King in a rematch of a classic Week 2 battle, which saw the Big Reds prevail in their closest game of the season, 24-21. The championship game is slated for Saturday at 7:30 p.m. Muskegon will be entering the game with a remarkable 27-game win streak. The Big Reds’ latest triumph wasn’t secured until they pulled away from Zeeland East with 14 unanswered points in the third quarter, to turn a 10-point halftime spread into a comfortable 38-14 lead. And the Big Reds managed to have their big third quarter without relying solely on standout junior quarterback Cameron Martinez, who Fairfield said likely suffered a deep bruise on his leg late in the second quarter and was noticeably limping. “It was a tough fall, just a lot of guys grabbing at him in the pile,” said Muskegon offensive right tackle Anthony Bradford. “But (Martinez) is a tough guy and he pushed through it. Muskegon instead relied on seniors Jeremiah Lockhart and Demario Robinson, who attacked from the inside and out. Lockhart got it started with three-straight big runs on the Big Reds’ first drive of the second half, the last being a 13-yard burst between Bradford and right guard Marquis Cooper to the end zone. Lockhart totaled 150 yards on 11 carries. 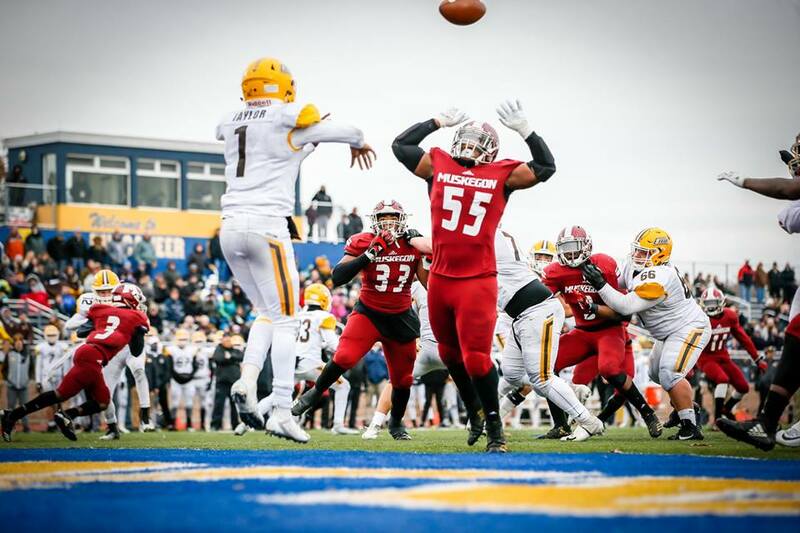 Muskegon iced the victory late in the third, when a successful nine-play drive was boosted by a 24-yard run from Robinson, then was capped by Martinez’s five-yard touchdown burst, putting the Big Reds up 38-14. Robinson, who totaled 117 yards on just six carries, showcased his blazing speed on another jet sweep with nine minutes left in the fourth for the Big Reds’ final score, a 41-yard sprint. Zeeland East quarterback Gabe Taylor scored on an eight-yard run with 1:24 left to trim the final margin to 23. Martinez vs. Taylor was a battle of elite scrambling quarterbacks in the first half. Martinez struck first with 112 yards on the ground in the opening quarter, including touchdown runs of 52 and 20 yards, to put the Big Reds up 14-0 at the end of one. Taylor willed the Chix back with a 14-yard scramble for a touchdown on the opening series of the second quarter, and helped tie the game with a 22-yard touchdown pass to Collin Anderson with 3:36 left in the half. The ensuing two-point conversion pass was tipped into the air in the end zone and hauled in by receiver Alex Stockdale to knot the score at 14-14. Taylor threw for 208 yards, but was picked off three times by the Big Reds defense. 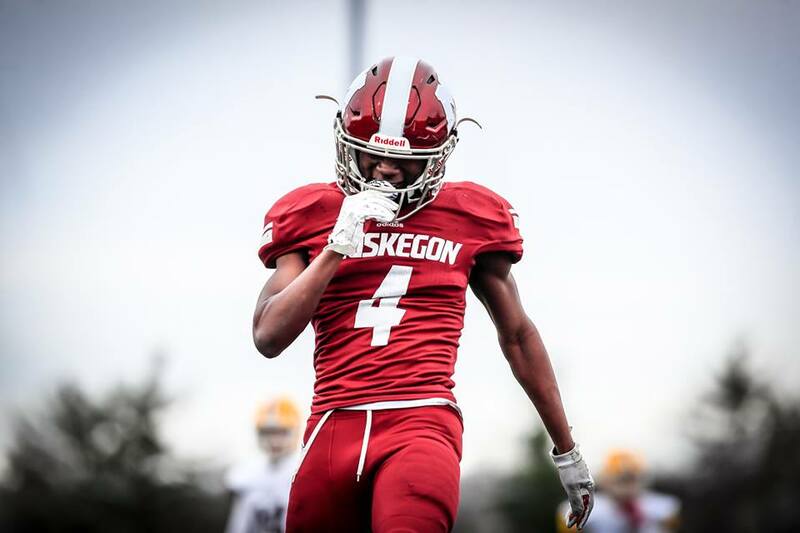 The Big Reds closed the first half strong, scoring on a straight dive by Lockhart, who ran untouched for a 65-yard touchdown, followed by a clutch 39-yard field goal by Carlos Hernandez-Sias that put Muskegon up 24-14 at halftime. That set up the big third quarter, when the Big Reds secured their ticket for a return trip to Detroit. “It’s just another chance to play with this group, which is a blessing,” Fairfield said. Senior defensive back Lamarion Sherrill said it’s an opportunity for the Big Reds to make history. “We helped (the class of) ‘18 get a title, now it’s our turn,” said Sherrill, who had a huge game with a first-half interception, a sack on a blitz and two pass break-ups.